Perhaps you’ve been there: You want to update your kid’s wardrobe for spring (or summer, or back-to-school, or what have you), but you find yourself absolutely dreading the act of shopping in a store. Even a jaunt to an old standby favorite store (hi, Target!) can start to feel formidable when you’re faced with the reality of packing up the kids, driving to said store, God forbid they have to try anything on that elicits some sort of inevitable meltdown, and then you’re stuck trying to check out as quickly as possible while bribing your littles to behave, only to arrive back home and discover you have to return half of what you bought… Yikes. Thankfully, you can get adorable kids clothes on Amazon right now, right from the comfort of your computer/chair. Yep, your seasonal kid-clothes update just became craziness-free — congrats. And now that we’re (finally) in that awkward spring transition time, your kiddo is going to need some light layers, cool jackets, and fun rompers/dresses for summer. 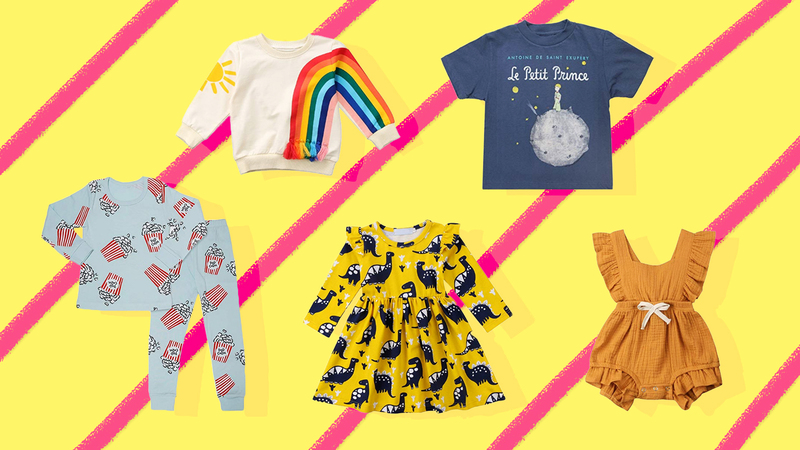 We’ve rounded up the absolute cutest kids clothes you can get on Amazon right now, delivered straight to your door. No stress, no meltdowns, no bribes. Now if only potty-training were this easy. 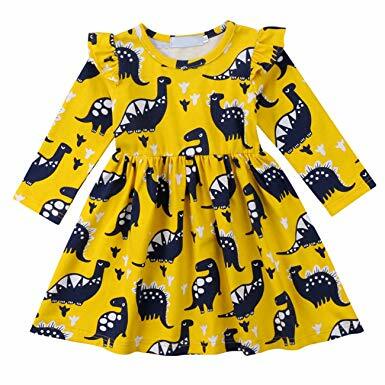 This adorable dino dress is perfect for your tiny tot who knows they’re fierce. 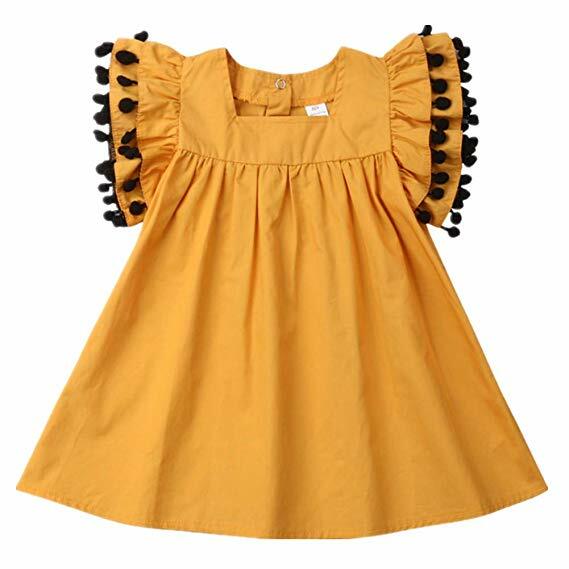 With a ruffle detail on the shoulders and a bright yellow color, it’s the perfect combo of femme and tough as nails — for a kid bound to rule the playground. 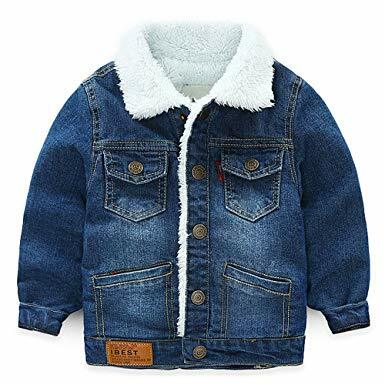 This denim jacket is the perfect cozy kids coat for that weird transition from winter to spring, when they still need some warmth, but that winter puffer coat makes them sweat. This jacket is lightweight, breathable, and sherpa-lined for softness and comfort. Two pockets for hiding their treasures complete the look and make this the ultimate jacket for many adventures. This shirt is from Out of Print, a company that makes shirts, bags and clothes with book covers on them, obv. 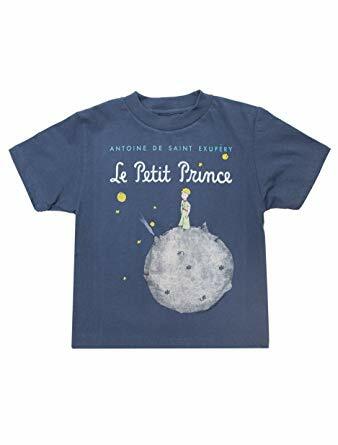 It’s a super-soft 100% cotton, perfect for your little prince/ss, and each purchase helps to fund literacy programs and book donations to communities in need. Need we say more? Have you ever seen anything as gorgeous and ruffly as this sleeveless sweater dress? Simply pop a long- or short-sleeved shirt underneath, and voilà, instant fashion. 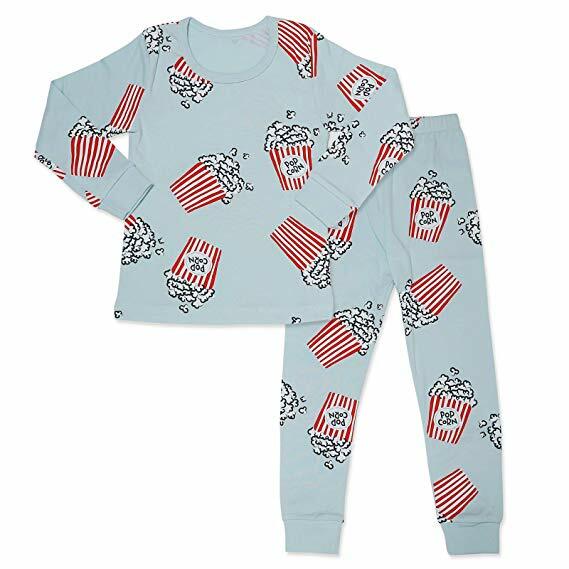 These too-cute-for-words pajamas come in a rainbow of patterns, colors, and designs (but our favorite is the popcorn) (or maybe the llamas) (aw heck we love them all). It might be a good idea to pick up a few sets of these. 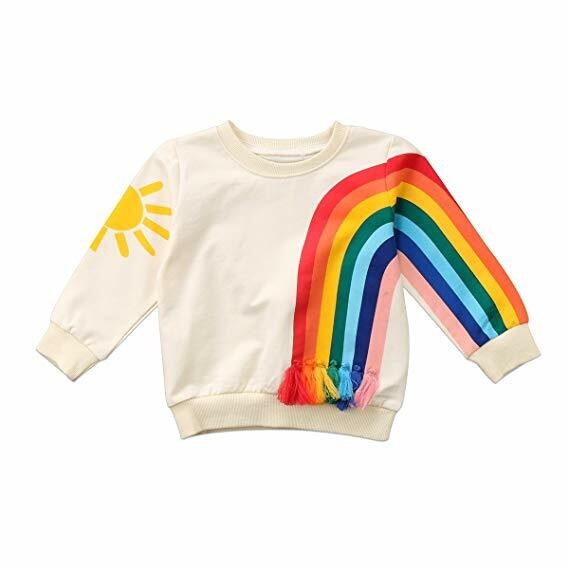 This sweater is sure to brighten up any rainy day with its festive colors and tassel rainbow. No kid can stay in a bad mood while wearing this, right? 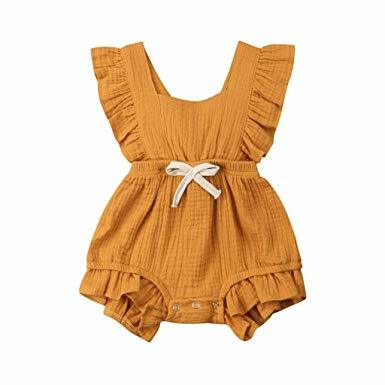 Now that it’s finally getting warmer out, it’s time to bust out the rompers for your little ones and let their chubby rolls free. Nothing is sweeter than a baby’s chunky legs, right? This frilly mustard romper is the best way to showcase them. 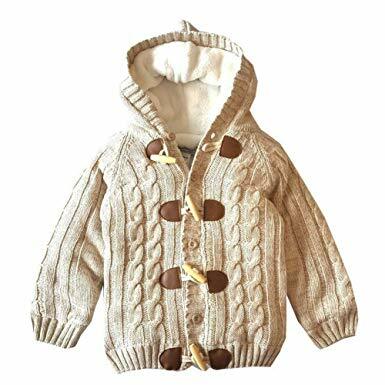 This hooded cable-knit cardigan is lined with coral cashmere for the ultimate in soft comfort — plus it has bamboo toggles to make it easier for tiny hands to close. Can we talk about this adorable mustard-colored dress?? It’s beautiful, and the contrasting pom-pom details on the sleves put it over the top. The back has two snaps to make it easy to get over little squirming heads, and the dress is machine-washable, which means it’s ready for any adventure your tot wants to go on. This gorgeous dress is great for your little one to throw on and get on about their day. The linen/cotton blend is light and comfortable, and the gray-green color is perfect for spring. 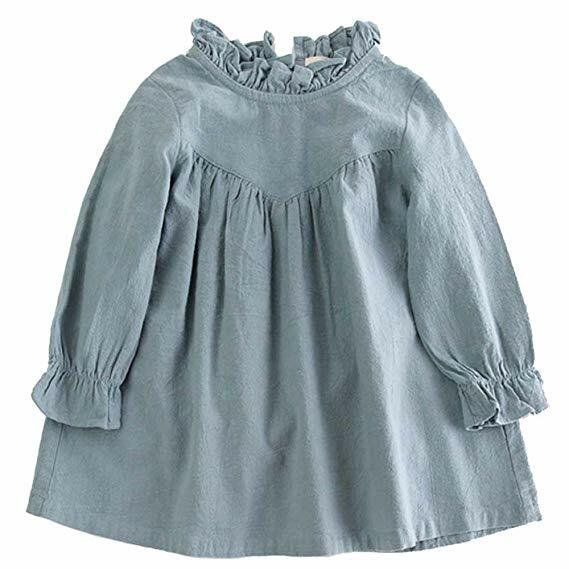 With the ruffle detail at the neck and elastic wrists, it’s good for a party, a trip to the museum, a playdate, an adventure at the park… you name it. 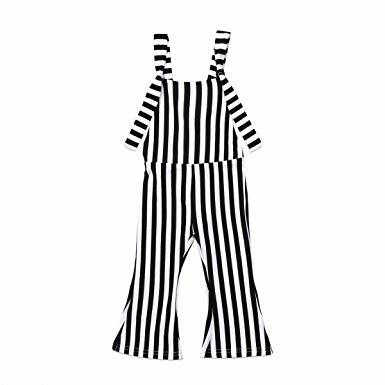 Bell-bottom pants are back in style, and your little one will love this jumpsuit with its contrasting stripes and crossed back. The fabric is stretchy and forgiving — and has us wishing it came in adult sizes. Anyone else’s babies spend the summer months basically naked? 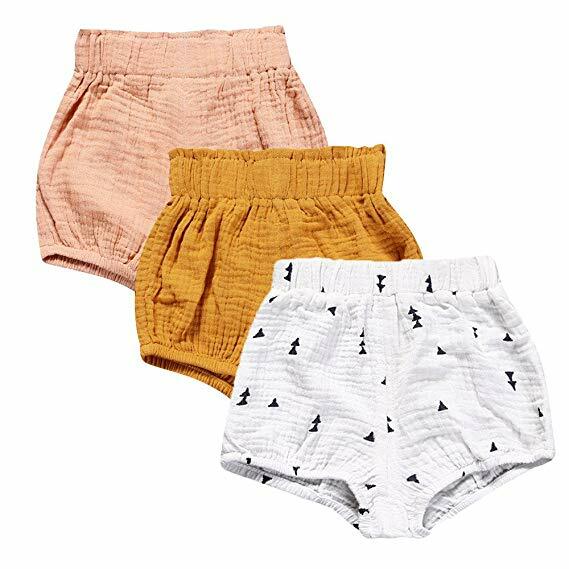 If that’s the case for you, these elastic-waist, easy-to-slip-on shorts are the best bottoms for your babe to wear all summer. They’re a light cotton/linen blend and fit perfectly over a diaper. Your kiddo will have the cutest bum in the ‘hood. 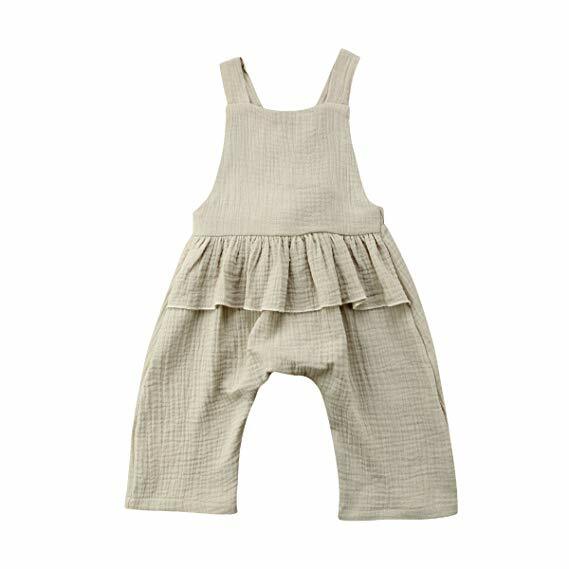 This sweet jumpsuit comes in taupe, pink, or white, and features a ruffle detail across the waist, as well as crossed straps in the back. Perfect for every aspect of playtime — and it isn’t tight or restrictive, so it won’t slow down kiddo’s fun. 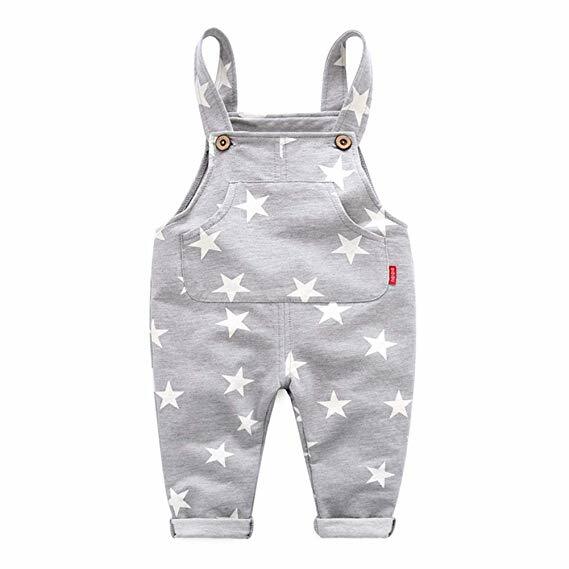 These star-patterned overalls come in navy or gray and are just cute as a button. Featuring a large pocket in the front and adjustable button straps, these are going to be your go-to easy outfit from now on. 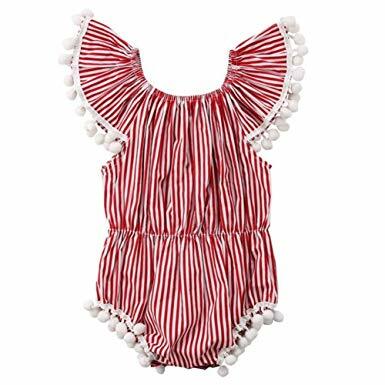 In case you thought your baby couldn’t get any cuter, try putting them in this striped onesie and see what you think. The pom-pom detail around the arms and legs adds movement and whimsy, and the elastic waist and neck make getting it on and off a breeze. 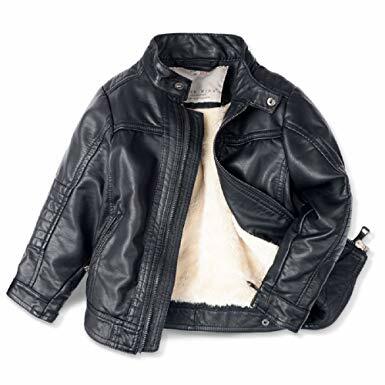 This leather jacket will make your too-cool-for-school kiddo the tiniest badass in the drop-off line. With zipper pockets and shearling lining, this is a great jacket for your little Brando.